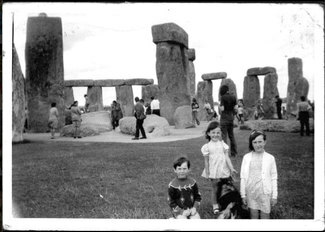 - Stonehenge Free Festival late 70s, early 80s. For many years during the 1970s and 1980s, a summer solstice festival was held in a farmer’s field across from the Henge. At dawn on the solstice, the modern-day Druids in white robes created a ceremony within the stone circle, a contemporary interpretation of the rites of the old religion which they continue to observe today. The rising sun appeared above the Heel Stone on this, the longest day, thrilling the expectant crowds who gathered for this auspicious moment. After the serious business of seeing in the solstice was done and the Druids had left the stones, informal ceremonies of marriage, welcoming of new babies, blessings of new mothers and old fathers, and many other colorful events were conducted amid the music, singing and dancing: modern day folk reweaving the fabric of gathering among the stones. Sometimes, it must be said, it was raining. Typical British mist and low clouds prevailed, and no discernible sun was to be seen for days, including during the solstice sunrise. But there were other years where the day dawned perfectly upon the plains. Clear mornings brought the sleepy-eyed out of their tents, caravans and makeshift shelters to join the colorful group within the giant sarsens and ancient bluestones. Stonehenge – the Giant’s Dance – on Salisbury Plain in Wiltshire is the best known megalithic stone circle in the world. Possibly dedicated to the worship of sun, moon and stars, the stones align to the midsummer sunrise. Built with wood set into holes dug with antler tools, the first henge was built around 3100 BC. It was rebuilt with bluestones from the Presceli Mountains in Pembroke, South Wales – an incredible feat, moving them two hundred and forty-five miles over sea, river and land. Around 2300 BC, the third and final stage of Stonehenge began when giant sandstones, or Sarsen stones, were brought twenty miles from the Marlborough Downs. The early Druids may have used the ancient stone circles for ceremonial gatherings, or perhaps for astronomical calculations, but their religion grew to be centered around the living trees, and their more secretive rituals were held in the groves and woods. 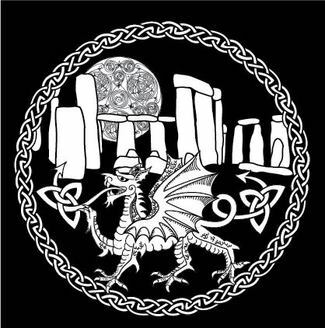 Although the Celtic Druids were once thought to have built Stonehenge, and perhaps they did help to rebuild it, it is older than the tribal peoples of Bronze Age Europe. The Ancient Order of the Druids was formed in 1781 as a secret society with principles of being convivial, fraternal and philanthropic. The druidic Grand Lodge visited Stonehenge for the first time in 1905, with much festivity and initiations for new members. The last century was a turbulent time for the ancient Henge, with a military camp established there during the First World War, the creation of the Ancient Monuments Act, and the addition of an enclosure fence of 1901. There were formidable differences of opinion between the modern day Druids and the Office of Works in the 1920s, and the Henge has seen its share of struggles between worshippers and the establishment ever since.